There are great brewing programs around that are simple to use and are very powerful. But what they lack is a seamless ease of access. Programs must be installed on whatever computer you are using, and online calculators require an internet connection. I want something I can take anywhere and access on any computer, either online or offline. I also want a file format where I could copy the recipe info and easily paste into a variety of formats. That is why I chose to go with an Excel workbook. If I want to work on a recipe on my lunch break, I don’t need to hack my work computer to download and install a program. If I’m brewing outside without internet access and need to change a recipe on the fly, I can do that. I can view and modify my recipes on any laptop, smartphone, or tablet. At my homebrew club meeting, I can access my files via Dropbox or a cloud server, and get any recipe info I need. Many brewing spreadsheets exist, but I found most of them either too simple or too complex. I either didn’t have all the information to formulate a recipe or the spreadsheet was so busy I got lost in it. Therefore, I decided to make my own brewing spreadsheet. I wanted a recipe formulator that was simple, easy to read. I hope you find it useful. 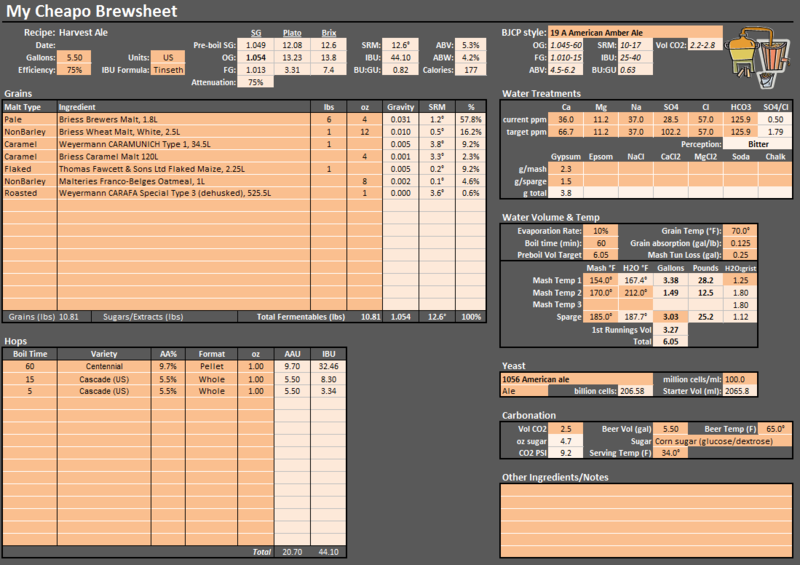 – 2.0.0 – replaced Brew Day Datasheet with a simplified, printer-friendly version. Added new hop varieties. I decided to make my own brewsheet because it gives me great flexibility to edit and control each parameter according to my brewing equipment and method. I can also take it anywhere with me, and access my files on any computer.